Welcome to 31 Days to Unshakable Faith! I’m so glad you’ve decided to join us on this 31-day adventure to strengthen our faith. There have been times in my life when reality collided with my faith and left me shaken, unsure, and defeated. As I cried out to God asking the same questions that suffering humans have asked for thousands of years, He began to teach me some life-changing lessons. I have a deep desire and longing to share my lessons-learned with you. I know I am not the only one who has weathered trials and wondered where God is and what His purposes are. Please know that you are not alone. My hope is that you will find encouragement here and that when your faith wavers in the face of reality, you will have the resources you need to stand strong in your faith. If you have friends or loved ones who might be interested in or benefit from this series, please share this page with them. You can also share this page through social media using the buttons at the bottom of this page. You never know who may be struggling to hold on to their faith in God. We have gotten very good at hiding our pain in this modern culture. Many suffer in silence. Get Chapter One of my new book, UNDEFEATED, for FREE by entering your email here. This page is our starting point on our journey toward unshakable faith. Below you will find the topics we will discuss each day so you can see where we are headed. I want to be clear up front that the topics I am tackling this month are all areas I am working on personally. I am not “there” yet. We are all a work in progress. If I ever sound “preachy” please know that I am preaching to myself and letting you listen in. I welcome your comments, questions, and feedback. I am currently writing a book on this subject called Stand Strong, Living Undefeated With Unshakable Faith. I would love for you to give your input. I want you to know I truly value your willingness to join me as we wrestle through some tough topics. No matter where you are in your faith journey, you are welcome here. This is a safe place to give voice to your questions, doubts, and trials. Know that God is in our midst and He always meets us where we are and He always welcomes the seeker. Day 4: Life is a Battle – Get Your Combat Boots On! Are you ready to stand strong in your faith and live undefeated? 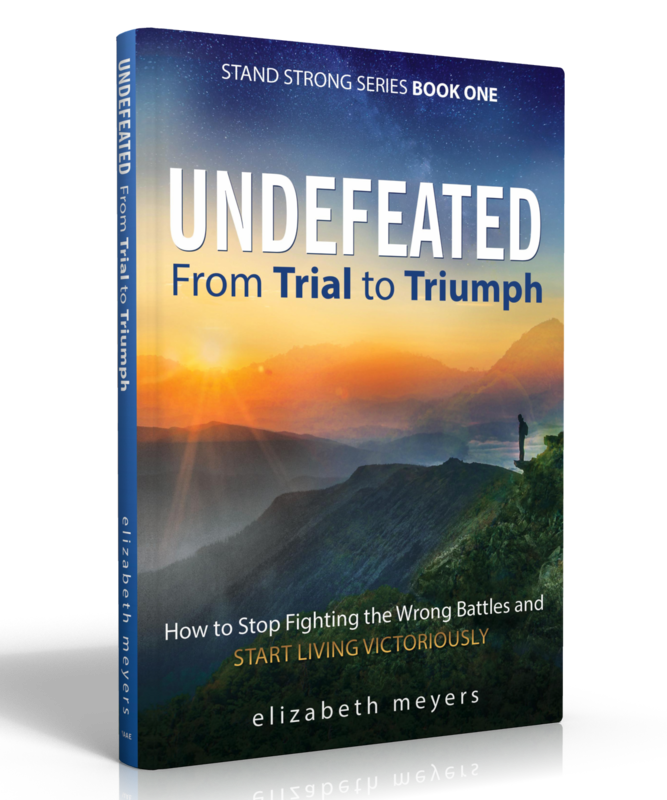 Click here to download Chapter One of my new book, UNDEFEATED: From Trial to Triumph. Or purchase your own copy from Amazon.